Sweet, aromatic anise-like flavor with slight hints of pepper and parsley. In French cooking, chervil can be substituted for parsley. 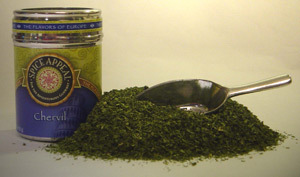 Chervil is one of the main ingredients in Fines Herbes. Adds a delicate flavor when lightly garnished over eggs, soups, meats, potato salads, and fish dishes. Complements cheese, stuffings, béarnaise sauce, mustard, potatoes and pastas.